So it looks like we'll be talking a lot about gravitational waves over the coming days, but why can't they be called "gravity waves?" In this social media world where brevity is key, it may seem that chopping "gravitational" to "gravity" is no big deal — it saves a whole six characters for an even more concise tweet! Though you'll likely see many news headlines heralding the wonders of "gravity wave science," do not fall into the trap! While both have gravity in common,gravity waves and gravitational waves are two very different beasts. Read on to find out why and then show off your gravitational smarts to your friends the next time you're down the pub. This image shows a computer simulation of the gravitational waves generated by 2 closely-orbiting black holes. Gravitational Waves are, in their most basic sense, ripples in spacetime. Einstein's theory of general relativity predicted them over a century ago and they are generated by the acceleration (or, indeed, deceleration) of massive objects in the cosmos. If a star explodes as a supernova, gravitational waves carry energy away from the detonation at the speed of light. If two black holes collide, they will cause these ripples in spacetime to propagate like ripples across the surface of a pond. If two neutron stars orbit each other very closely, energy is carried away from the system by — you guessed it — gravitational waves. 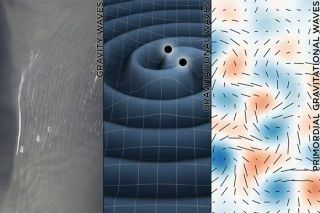 If we could detect and observe these waves, a new era of gravitational wave astronomy may be possible, allowing us to differentiate between gravitational wave signatures and work out which phenomenon is generating them. For example, a sudden pulse of gravitational waves may indicate they came from a supernova explosion, whereas a continuous oscillating signal may indicate two closely-orbiting black holes before merging. So far, gravitational waves are theoretical, even though strong indirect evidence for their existence is known. Interestingly, as gravitational waves propagate through spacetime, they will physically warp the "fabric" of space, very slightly shrinking or expanding the space between two objects. The effect is minuscule, but using laser interferometers — such as the Laser Interferometer Gravitational-Wave Observatory, or LIGO, that measures the tiniest perturbations in lasers reflected along 2.5 mile-long L-shaped vacuum tunnels — the propagation of gravitational waves through our planet may be detected. In the case of LIGO, there are 2 stations located on opposite sides of the US separated nearly 2,000 miles. If a gravitational wave signal is real, its signature will be observed at both locations; if it's a false positive (i.e. a truck driving past) only one station will detect it. Though LIGO started operations in 2002, it has yet to detect gravitational waves, but in September 2015, the system was upgraded to Advanced LIGO and hopes are high that, finally, physicists may have some good news for us on Thursday. This plot shows data from the BICEP2 telescope located in the South Pole. These wiggles were thought to be the signature of "B-mode polarization" in primordial cosmic microwave background (CMB) (a characteristic of gravitational waves produced by the Big Bang). Alas, the signal was actually being caused by polarizing dust in the Milky Way. The search continues. Extra Credit: Primordial gravitational waves. You may remember the kerfuffle about the BICEP2 "discovery" (and then un-discovery) of gravitational waves in the weak primordial "glow" of the Big Bang — known as the cosmic microwave background (CMB). Although the BICEP2 "discovery" turned out to be a dud, it is believed that tiny gravitational perturbations around the time of the Big Bang may leave their "fingerprint" in this ancient radiation as a special kind of polarized light. Should the fingerprint of primordial gravitational waves (i.e. gravitational waves produced by the Big Bang) be observed, certain models for cosmic inflation and quantum gravity may be confirmed. However, these are not the gravitational waves that LIGO is hunting for — LIGO (and other observatories like it) is looking for gravitational waves being generated by energetic cosmic events happening right now in our modern universe. The hunt for primordial gravitational waves is more of an archaeological dig into our universe's past. This NASA observation shows the formation of gravity waves in the atmosphere over the coast of Indonesia.